Teach your kids about the armor of God with 48 themed Bible memory verse cards! They will learn what the Lord has to say about taking up the full armor of God, who we fight, and who the battle really belongs to. Children love to learn, and childhood and young adulthood are the perfect time for memorization--their brains are primed for it. Use them in coordination with your Armor of God Bible study and lapbook. There are a number of Bible memory card sets available in the store at ThinkingKidsPress.com. You'll find a Bible memory verse card divider included in this set so that you can keep your sets separated, along with a copyright card. 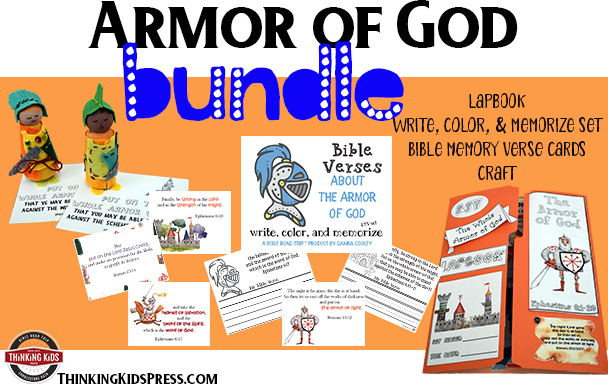 The Bible Verses about Armor of God for Kids set is based on Ephesians 6:10-18a. You will find cards on the armor of God, fighting the good fight of faith, and on standing firm in Christ, our Savior. God is our refuge, shield, and fortress. We are only able to fight when we depend fully upon him.